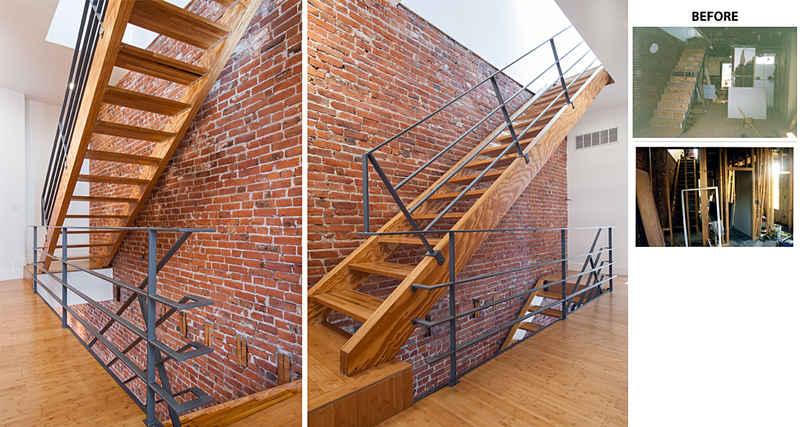 Oak remenant treads and a recycled steel rail make this contemporary staircase sleek and sustainable. When architect Nathan Dirnberger purchased a home in the city in 2003 for just $37,000, it was in desperate need of repair. The roof had leaks. The basement was half full of water because pipes had not been winterized. “It was pretty beat up,” Nathan says. Over a span of seven years, Dirnberger took the neglected home and transformed it into a cool, contemporary urban dwelling. One of the biggest renovations was the rebuilding of the three-story home’s multilevel staircase. The previous staircase included a half wall instead of an open rail, and the space beneath the stairs was entirely enclosed. To open up the home, Dirnberger handcrafted a minimal and open design with the use of repurposed materials from around the area. Before the actual staircase could begin to be built and installed, he had to remove the original stairs and provide structural reinforcement. Once the space was secured, Dirnberger constructed the staircase’s stringer (a long horizontal board that connects the treads to the staircase and the staircase to the structure) out of two laminated veneer lumber boards (LVLs) glued together. Each is three inches thick and 18 feet long, giving the staircase substance. Screwed to the stringers by aluminum angles, the stair’s treads were individually finished with semigloss polyurethane and installed. The treads are fabricated from oak butcher-block remnants Dirnberger purchased for $60 from HAVCO Wood Products, based out of Cape Girardeau. “The tread material is a high-quality oak, which makes it structurally very strong and a fantastic, uniform material,” Nathan says. At 1¼-inches thick, the treads nearly disappear when looking at the staircase from the side. The steel-welded handrail was created from leftover steel purchased from Shapiro Metal in St. Louis. The railing was fabricated in place and at only 1½-inches thick, it gives a thin appearance as you approach it while being a good fit for your hand. Once the structure was complete, Dirnberger raised it into place with the help of family and friends. “The staircase weighed close to 400 pounds,” he says. With open risers and a sparse railing, the completed staircase minimizes its presence in the home, while maintaining the openness of the larger volume in which it is situated. When the current owner of the home, Adham Abdelfatta, purchased the residence in 2011, the staircase was one of the architectural elements that drew him to the property. “I loved how Nathan designed and created such a spectacular structure that stands so massive, yet so invisible in relationship to space inside the home,” he explains. “Each morning, the light floods the room and flows right through the open staircase. The visual appeal is spectacular."